Tillandsia stricta Sol. ex Ker Gawl. 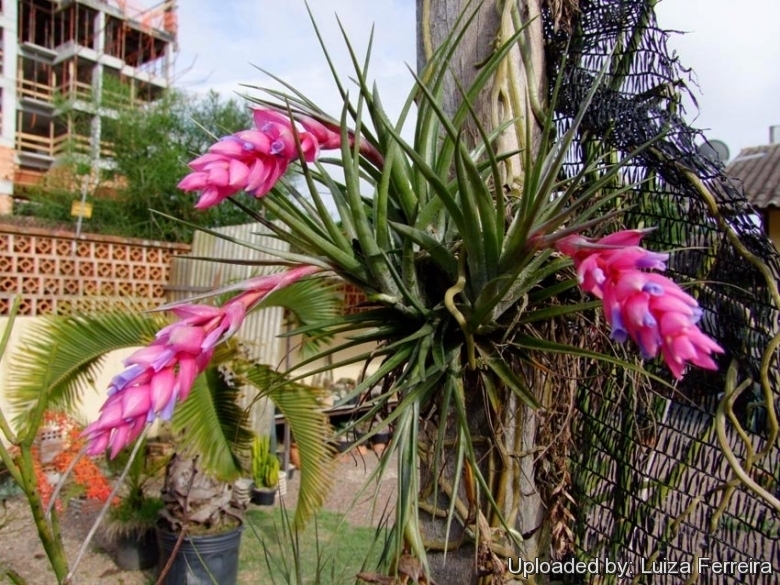 Origin and Habitat: Tillandsia stricta is a wide-ranging species found in eastern South America from Venezuela to northern Argentina (Trinidad, Guyana, Suriname, Venezuela, Brazil, Bolivia, Paraguay, Uruguay, Argentina). Altitudes range: From sea level to 1,700 meters. Habitat and ecology: This species grows as an epiphyte on just about anything that will support it and thus do not require soil to grow, it gets its nutrients from air and water through its leaves. It cannot grow where the air is too polluted, like lichens in the north. Inundation during the wet season probably eliminates all of the relatively moisture-sensitive seedlings except those attached to a host, whereas larger plants tolerate the same annual flooding. Tillandsia stricta can occasionally grow as a terrestrial, and in that order it require a nurse shrub until large enough to survive on the ground and sometimes forms almost confluent carpets on the sand beneath certain shrubs forming restinga 'islands' northeast of Rio de Janeiro, Brazil. Habitat conditions vary — some plants grow in mesic regions that receive frequent rainfall, while other plants endure dry periods in less mesic areas. Tillandsia stricta is one of the few species that can germinate about as well in light as in darkness. Tillandsia stricta var. disticha L.B.Sm. Description: Tillandsia stricta, sometimes called the "air plant" is an evergreen, clump-forming, short-stemmed, perennials with leaves arranged into thick rosettes that grows epiphytically. It is a medium size species to about 10 cm across and 15 (-22) cm high. The leaves are recurved and covered with a kind of frost like scales, lanceolate, pointed, longer than the scape and grows a bright red or bright rose spike with bright blue flowers. The spike is first held upright but then droops as it lengthens. It is quite variable over its range: from soft leaved specimens to much harder, stiffer types and different coloured forms from light green leaves to silvery leaves and even verging on black. There are many cultivars of this species in cultivation. Tillandsia stricta has been used with other species such as Tillandsia albertiana and Tillandsia recurvifolia to make many hybrids. Derivation of specific name: The origin of this plant’s scientific name epithet (stricta) means ‘narrow’ and describe the narrow foliage of this plant. Leaves: Numerous, sometimes secund, springing from a short fleshy rootstock much in the manner of those of the common Pine Apple, very narrowly triangular, lanceolate-acuminate or form-acuminate, convolute, longer than the scape, about 6-18 cm long nearly 4-12 mm broad at their base whence they taper their whole length covered with appressed cinereous scales thicker towards the base of the leaf. Sheaths narrow and inconspicuous. Roots: Tillandsia stricta plants, like other airplants, have little or no roots and absorb most or all of the water and food through their leaves. The eventual roots are used by these plants only to attache themselves to rocks or tree hosts. Inflorescence: Scape erect, to decurved, lender, usually well developedand less scaly than leaves, of the thickness of a common pen about 15 cm high. Scape-bracts imbricate, the lower sub-foliaceous, the upper with elliptic membranaceous lepidote sheaths and linear blades. Inflorescence simple, typically of many polystichous flowers, 2-7 cm long, dense or lax at base, 15-35 mm in diameter. Floral bracts erect to spreading, elliptic, membranaceous, large ventricose oblong yellowish white to rose, the lower cuspidate and exceeding the flowers, lepidote at apex, filiform-laminate. Flowers: Narrow cylindrical about 18 mm long scentless. Calyx thickish trifid persistent convolute pale reddish brown. Sepals lance-ovate, acute, 9-13 mm long, equally connate for 2 mm, membranaceous, glabrous. Corolla longer than the calyx tripartite or tubulose and trifid. Petals 5-24 mm long, exceeding the stamens, of a deep violet-blue finally changing to a deep red ovate acute, blades narrow, obtuse or emarginate and spreading at the end as long as the bracts. Filamens about equal to this in length plicate near apex. Style straight white with stigmas just overtopping the yellow anthers. Ovary pale green four times shorter than the style, which is continuous with its apex, quite free from the flower. Blooming season: Early summer. The actual flowers are not long-lived, lasting for about a day at best, before it starts wilting, but the colourful bracts remain attractive for up to 10 weeks. Fruits (capsules): Slenderly cylindric, to obtuse trigonous, three celled, to 4 cm long dark brown about the thickness of a crow-quill, pointed, many seeded. Tillandsia stricta Sol. ex Ker Gawl. : Distribution: Trinidad, Guyana, Suriname, Venezuela, Brazil, Bolivia, Paraguay, Uruguay, Argentina. Tillandsia stricta var. disticha L.B.Sm. : distribution: State of Paraná in Brazil. 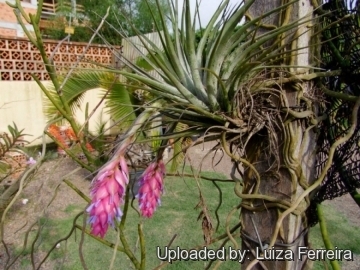 7) “Tillandsia stricta” in: <http://www.plantsrescue.com/tillandsia-stricta/> Web. 3 Mar. 2015. Cultivation and Propagation: Tillandsia stricta produces, when mature, bright red or bright rose bloom spikes with bright blue flowers.This is among the most beautiful of its genus and one that is very easily cultivated. Grow it in a well ventilated place mounted on wood or grown bare root. They can also be grown on slabs of bark or tree fern fibre. Allow medium to dry out between waterings.